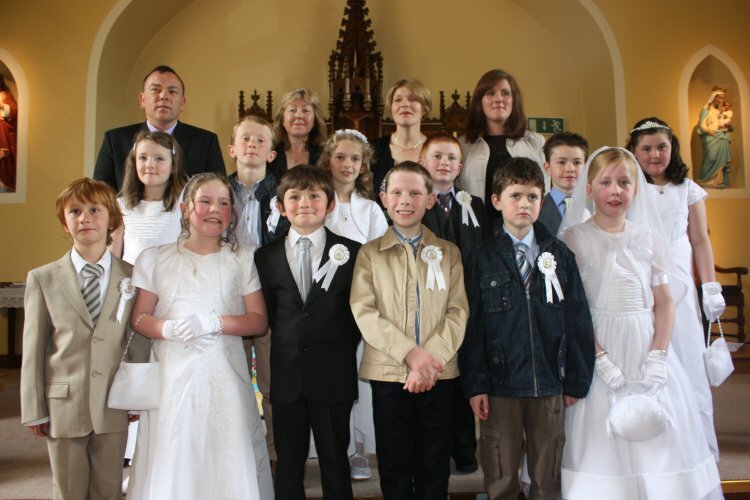 Children from Rang II Terelton National School who received their First Holy Communion in Toames on Sat 14th of May. Front Row: Maciek Zwirkowski; Ciara O'Donovan; Liam Proudford; Gavin O'Leary; Niall Madden; Therése Kelly. Centre Row: Aisling Murray; Tom Downey; Lavena Harrington; Shane O'Leary; Alex Wood; Jennifer O'Donoghue. Back Row, School staff: Tomás Healy NT, Principal; Norma Murphy NT; Mary McCarthy NT, Class Teacher; Nora Buckley, Classroom Assistant.